I prefer to keep a dividend portfolio in individual stocks rather than in index funds. There are plenty of index funds in my other retirement vehicles. I like having the various dividends pour in over time. I feel much more hands on watching the various stocks go up and down and dang it, it is just more exciting this way. I don’t automatically reinvest my dividends. I let them pile up and then choose a specific stock to plow them back into when the hit the $300-500 range. Over the years I have fine tuned my approach to stock buying and portfolio building. Here is a post if you are curious. I also came across this little gem below from Novel Investor. If you ‘open link in new tab’, the interactive model will let you look at each asset class. Just make sure you come back! Pretty diverse portfolio with quite a few names in common with my own. Looks like you are well on your way to building a nice growing passive income stream. Look forward to following your journey. Thanks, I have corrected it. Learn something new everyday right! Quite a nice diversified portfolio. That has the potential to throw off a lot of dividends. You have built up quite a nice portfolio. Very diverse too. I share a few of the same companies in mine and many of them are on my watch list for future purchases. Looking forward to seeing its future growth. Very diverse group of companies you have there! Your about to hit 6 figures on both accounts soon, hopefully I can make it to the 6 figure club sooner than later. Hope you had time to check out my new post and I will stop by and read your posts when they are available. Great looking diverse portfolio with quite a few names in common with my own. In the future this portfolio has sure potential to throw off a lot of growing dividends. Wow, it looks like you have a solid portfolio. Many of which I have owned (I sold them to buy my rental property), but I’ll continue to buy them as more money coming back into my taxable account as my rental property is starting to produce a profit. Best of luck to you. Continue sharing! You’re building up a nice solid dividend portfolio. One suggestion, maybe create some similarity between your two tables in terms of format, color could be different. I like the one where it lists the name of the company you’re invested in. I don’t know all the companies solely by their stock tickers. You have pretty large and diversified portfolio with high quality stocks (as well realestate assets). Most of your holdings are in my watch list, I will start accumulating them once Canadian dollar gain some value over USD. Wow, congrats on your broadly diversified portfolios with many strong companies providing you with nice organic growth. Glad to have you as fellow shareholder in XOM, CVX, UN, BHP, KO, DIS. Wish I would have doubled down on that Unilever recently instead of little $300 buys. Very diverse portfolio! I have a few of those holdings in mine, or on my watchlist. I accumulate dividends in my accounts and select which stock to buy as well. Looking forward to seeing how the portfolio grows over time. I’m impressed by your diverse portfolio. And I know it’s not as easy to do this, as one may think. I also like your honest writing style and your interesting journey. I know everyone clicks for the net worth and the portfolio choices, but in the end it’s the interesting story behind. At least for me. Thank you and please continue to blog! Thanks, I appreciate you taking the time to dig a little deeper. Very diverse, well done. Keep up the good work! Is the SIPC limit of $500k for cash balances held in brokerage account of for the entire brokerage account value? Love your site great job! Took a look at your portfolio, contrary to other posters you do realize I am sure, that your portfolio is far from diverse. Not to mention the amount of money you are leaving on the table. But, you are aware of this, I’m just puzzled as to why? Just here for the steady accumulation of passive income from stable stocks, even at the expense of big growth. 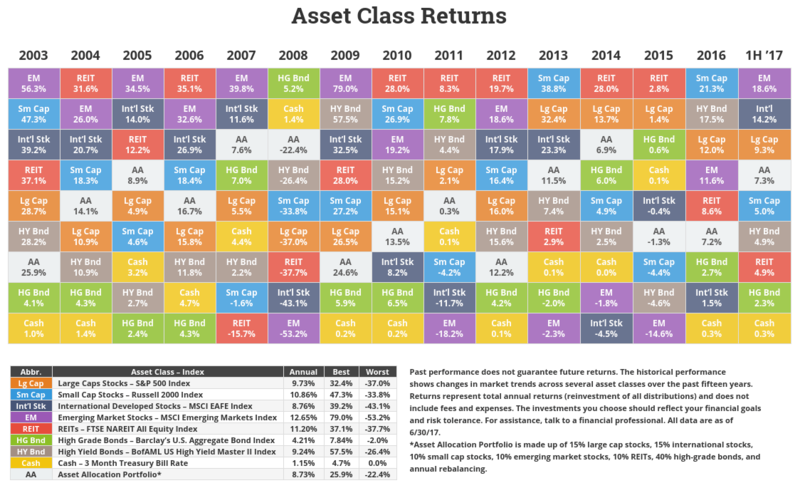 Nice diverse portfolio, love the asset class return chart. I’m the same way as far as reinvesting dividends, I let them pile up for my individual stocks. My index fund I do reinvest. Keep up the good work, looking forward to see your portfolio grow. Right back at you expat, read your monthly net worth update today, good stuff. I am a newbie. Can you help? Great idea having two seperate accounts for the extra SIPC protection. Some great companies in your portfolio othalafehu! Nice portfolio! Does anyone of you use Google finance spreadsheets to follow your portfolio like me?